When I started Yoga with Adriene's Yoga Camp, I had no intention of doing 30 days of yoga. I thought it would be a good way to balance my start to running for the year, but here I am, 11 days in, and I'm fully committed. Monday: 3 easy miles; 30 minutes of yoga. Thursday: 25 minutes of yoga. Friday: 25 minutes of yoga; 3 easy miles; 2-mile bike ride. Saturday: 30 minutes of restorative yoga. Sunday: 30 minutes of yoga; 4-mile run. While yoga is going well, I had a realization last week. Since Chicago, I've been lazy...rarely running, and when I am running, I'm running low mileage on flat courses at paces minutes slower than I'm capable of. I've settled into a comfort zone but when it comes to the marathon, there's no such thing as the comfort zone in the marathon. I'm never going to run a sub-4 marathon if I stay inside this comfort zone so, starting this week, I'm pushing out of the comfort zone. I won't increase my mileage too much because I do need to keep myself uninjured, but I'll definitely be pushing the pace and incorporating some strategic workouts into my training in order to really set myself for a strong start to marathon training when that time comes. 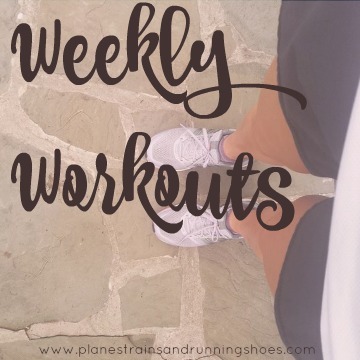 What are your favorite running workouts to do?